A physiotherapist has allegedly been fleecing the medical aid accounts of dozens of members, claiming for consultations he had not had with them. But this time, he messed with the wrong woman. Early last month Dorothy Masilo (50) noticed suspicious transactions on her Bonitas standard option account. The claims were made by physiotherapist Pholoso Peu for sessions dating from November 27 last year until the last claim on February 15. But she had not met him, had not been for a consultation with Peu – whose online presence suggests he’s from Soshanguve – and in fact had not heard of him. Masilo, who lives in Orchards in Pretoria, found Peu had claimed from her medical aid 14 times for her supposed sessions with him and 15 times for her son’s. Her 25-year-old son is a dependant on her Bonitas account. She has no idea how Peu got the details of her medical aid scheme. At the beginning of this month, health practitioners voiced their displeasure at being painted as though they were the main drivers of fraud, waste and abuse in the private medical sector, which costs the industry R23 billion annually. Instead they claimed they faced harassment and underpayment by the medical schemes. They made this assertion at the inaugural fraud, waste and abuser summit by the Council of Medical Schemes. Masilo believes her case has lifted the lid on Peu’s seemingly fraudulent behaviour. When she contacted Thabazimbi Hospital, which was his last known point of contact, she was told she was at least the “50th person” to call in complaining about Peu since he left in 2012. An official at the hospital confirmed to City Press that Masilo was one of many calls that had come in about Peu, who had left the hospital after completing his in-service training in 2012. City Press tried to make contact with Peu, but his number is no longer valid and he has not responded to messages on his social media networks – Facebook and LinkedIn – asking him to make contact and comment. “When I received an SMS from my [medical aid] scheme saying it was processing a claim for R1 442 made by Peu on February 7, I immediately contacted the scheme to say that was a fraudulent transaction and they shouldn’t pay. But I was told I had to make an official affidavit to that effect at a police station. When I contacted the Health Professions Council [of SA], I was shocked to hear that when he had made that claim he was on suspension,” she told City Press this week. The council’s spokesperson, Priscilla Sekhonyana, confirmed that Peu had been suspended since November last year. But it was over non-payment of his annual fees. She confirmed that Peu had two complaints lodged against him, both relating to medical aid fraud. 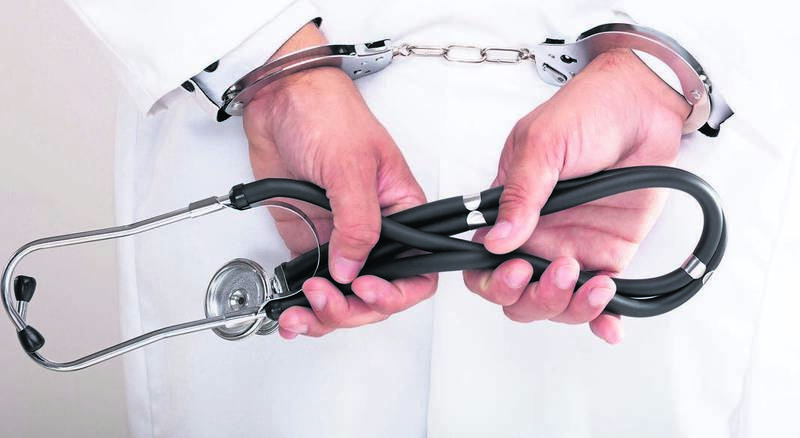 According to section 66 of the Medical Schemes Act, medical aid fraud, committed either by a member or a healthcare practitioner, is a criminal offence that carries a fine, imprisonment or both. What to do when suspecting fraud on your account? According to the Health Professions’ Council SA: “It is the responsibility of the patient to check the statement received from the medical aid scheme. “Our most invaluable tool against fraud, waste and abuse remains our members,” says Bonitas chief operating officer Kenneth Marion. “To assist them to be proactive we have a toll-free fraud hotline – 0800 112 811 – to report any incidents of suspected fraud, waste and abuse. Last year Peu was also on the Government Employees’ Medical Scheme’s list of practitioners whose claims they would not pay. The scheme advised their members to pay him upfront for services and then claim back from the scheme, if they wished to consult him. Kenneth Marion, chief operating officer of Bonitas Medical Fund, said the scheme had first investigated Peu in 2017 for tariff manipulation. It managed to recover R14 114 in overpaid claims made out to him. Explaining how practitioners were able to flout processes and claim for services they hadn’t rendered, Marion said: “Some healthcare providers commit fraud against one specific scheme at a time and, when they get suspended, they migrate to the next scheme. “It is highly likely that he has moved on to claiming from other medical schemes for the past two years. Bonitas said it had since reversed all claims by Peu and had refunded Masilo. It said it had flagged his practice and was investigating the potential false claims for other members for the past year to now. Marion said that fraud, waste and abuse were not just ubiquitous in the country, but also in the healthcare industry. According to Discovery Health – South Africa’s largest scheme – it said it had recovered R555 million last year in fraud, waste and abuse against the scheme, with at least 40% of that being from claims submitted for services not rendered. Although the total amount he claimed against Masilo was only R3 200, she said she was speaking out for all those who might not have realised their accounts had been fleeced in that manner. “I’ve been with the same scheme since 1998 and was so frustrated by this whole thing. I’m fortunate in that I work in an office and have constant access to my emails, but what about those who don’t? Have you – or anyone you know – had your medical aid scheme fleeced by a dodgy doctor? Will you start checking your scheme accounts more carefully now?